The banner o Guatemala features twa colors: sky blue an white. The twa sky blue stripes represent the fact that Guatemala is a land locatit atween twa oceans, the Paceefic Ocean an the Caribbean sea; an the sky ower the kintra (see Guatemala's Naitional Anthem). The white colour signifies peace an purity. In the centre o the banner is the Guatemalan coat o airms. It includes the Resplendent Quetzal, the naitional bird o Guatemala that seembolizes liberty; a pairchment scroll bearin the date o Central Americae's unthirldom frae Spain, 15 September 1821; crossed rifles, indicatin Guatemala's willinness tae defend itsel bi force if need be; a bay laurel croun, the seembol for victory; an crossed swords, representin honor. The Central American banner wis uised in Guatemala till 1851, when a pro-Spainyie faction teuk ower an addit the Spainyie colors o reid an yellae tae the banner. The oreeginal colors wur restored on August 17, 1871, but as vertical (rather than horizontal) stripes an wi a new coat o airms. The Resplendent Quetzal previously appeared in the 1830s in the banner o Los Altos, the saxt state in the Federal Republic. The Guatemalan Banner haes chynged throughoot history an arrivin tae its current design in 1871. 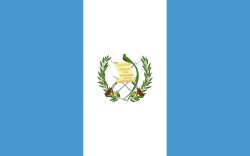 Wikimedia Commons haes media relatit tae Flags of Guatemala.